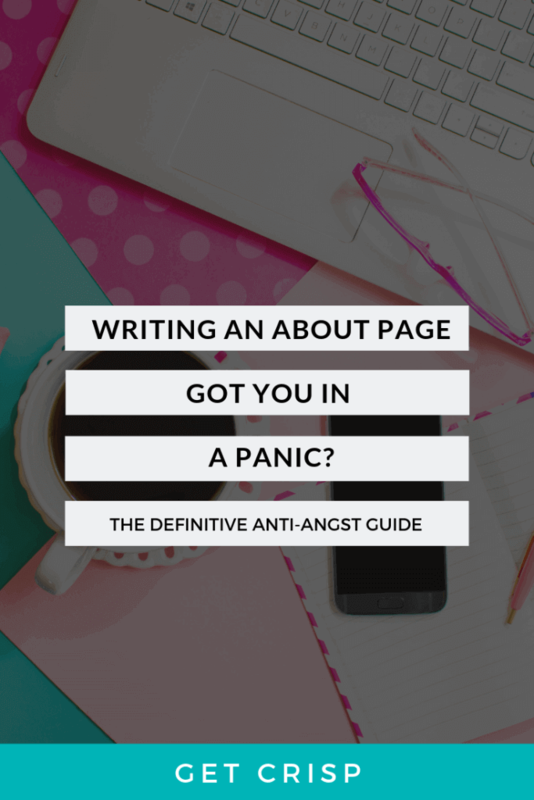 Writing An About Page Got You In A Panic? I’ve won awards for writing crisped copy for businesswomen in Australia and around the world. I have clients who won awards after I wrote for them. I’ve rewritten business brands in ways that not only tickle the people who do the communicating but also tick boxes for the folk on the board. I’ve had everyone nodding at the same time to the words I’ve delivered and I can look at a brand’s website and in 0.3 of a second know what’s missing from their About page. But when I started writing my own About page, it did my head in. If anyone enjoys writing their own About page, then I’m calling…them a liar. Either that or they outsource. Outsourcing is sensible, because I wrote my first About page 758 squillion times before getting it right. You need to nail your About page. Which is why writing an About page is so terrifyingly important and scary. It’s your copy’s job to help people connect to you, and for that, you need to give. To add fuel to the fire, writing an About page which will not only entertain but also convert and have customers coming back for more isn’t just about the ability to sing your own praises. To make that nutritionally sound dish sizzle, you need a secret ingredient. Know what it is? The biggest and most valuable asset which makes your business different from businesses similar to yours is YOU. Seems pretty easy doesn’t it. Writing copy which sounds like you, and an About page that shows who you are sounds like something that should come easily. It doesn’t. It’s hard. It’s hard to be a woman and be unapologetically, uncompromisingly you. I can understand why so many businesswomen take the tragic misstep of ditching their attempts to sound like themselves, and settle for ‘safe copy’, which sounds like everyone and no one. Why is it so scary to be yourself? Next time you catch public transport, have a look around. Who naturally, comfortably, un-self-consciously fills the space around them? Who sits with both feet on the floor, shoulder width apart? Some women will do it, but this is mostly a man’s modus operandi. Who sits with their shoulders narrowed, legs crossed, hands together, trying to take up as little space as she can? Yep, I said ‘she’, because 9 out of 10 times this will be a woman; maybe it’s you. Women are conditioned to take up less space in our world – literally. Safe copy is like that. It’s speaking quietly, minding your manners, not letting anything out, and hoping everyone will think you’re nice. Well, I say balls to that. you’re not the cherry in the Old Fashioned. You’re the whiskey. Which is why you need a healthy measure of bravery and a bit of guidance before you start. This is where I come in, because getting in touch with your brave voice crisps up your copy, but it takes practice, and a bit of help. 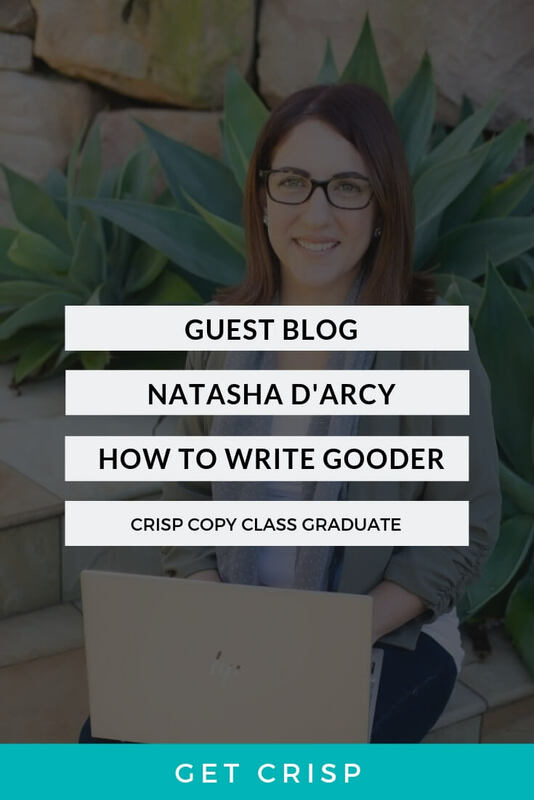 Whether it’s learning the tricks and quirks of effective DIY copy, 1:1 coaching or the done-for-you Crisp Copy experience, I can work with you to turn your half-whispered tune into an anthem. So why wait? Let’s get started now. Writing an about page – the panic free version (broken down in bite-size chunks). Who Are You Writing As? Let’s knock this one off first, because I see it so often. Let’s imagine you’re back on that bus again. If I started talking to you and kept saying “we” instead of “I”, would that sound weird? You’d be looking frantically for the ‘next stop’ button. So I’m going to say this straight out. Write in active first person: “I am a yoga instructor/fire eater/financial advisor.” I know, I know – so many of you think using ‘we’ makes you sound bigger and more professional. In reality, it confuses the reader and distances them from you, which is the opposite of what you’re trying to achieve. Whether it’s sounding posh or too much potty mouth, if the way you write isn’t consistent with the way you speak, don’t use it in your copy. For a good consistent brand story to work, you don’t want to seem completely different to how you ‘sound’ in your copy. You get a little leeway in your About page to be less formal, but if it’s vastly different from the tone you strike in the rest of your website, it’s going to read weirdly. Keep it conversational. Clichés are overused words and phrases: they come across as insincere. Here’s one: passionate. You might be a “passionate curry curator”, “passionate about learning”, or “have a passion for customer service”. There’s so much passion in people’s About pages, we’re all suffering from Passion Fatigue. There. It’s a thing. It sounds mean, but when we read about your “passion” our eyes glaze over because you’ve started sounding like everyone else: boring. And the only thing worse than boring is when we don’t even READ the word anymore, because we’re so inundated with it on websites. A solid, effective About page that works for you is how people get to know your backstory, build likeability, trust, and ultimately, buying your stuff. Never forget your story needs to have a clear purpose. While you don’t want your About page to read like a sales page, if you’re not using one or two Calls To Action, it’s an opportunity missed. Make it easy for your reader to be able to buy your stuff, or at least travel to somewhere else on your site which will lead them closer in your new relationship to second base – a sale. Who Should You Get to Write For You? When outsourcing your About page, or any of your copy, make sure you choose someone who can write in your voice. This is usually going to be someone who is naturally empathetic – if they’re not, it’ll just sound like their stuff. Good copywriters have the ability to capture your voice and essence, and write your words in a tone of voice which is a more persuasive, word-nerdier version of you. Your Mum, your partner, a friend, or anyone who is emotionally invested in you as a person is not the person to read and critique your About page. They’ll either love it all because they love you, or criticise the wrong parts, because they were good at English back in the day. If you don’t have access to a professional editor, copywriter, or someone who knows about marketing, find someone who is your ideal client and get them to read it: they’re the one you want to connect with. Let’s do it – let’s nail you DIY writing your own About page. Right now! Oh, hang on, before we set off, you might like a more comprehensive guide than this here blog. Here’s one I prepared earlier! It’s free. Bonus. Or, if this blog has given you cold sweats already and you’d like me to write it for you, get on my waitlist here. If you decide to embark on the gruelling journey that is writing an About page, here are some things you need to think about before you start. Before you know how to write like you, you need to know who you are and why you’re here – in a business sense. What’s your vision? What’s your mission? What are your guiding ethics? How will you show them if you don’t know them? Sometimes the reason you’re having trouble with your About page is because you haven’t done enough navel-gazing to find your ‘Why’ – what’s driving you to start your own business. If you don’t know the why that’s going to hamper your business at almost every level, so go back, find your happy place, and give that one some thought. Who’s your ideal client? How old is she? What does she do? Where does she work and play? What does she read? Is she a she? You can’t write something she’ll love if you don’t know who she is. Find out where she hangs, and hang there too. (In a joining like-minded groups way, not a stalkery, picking up her fallen hair way). You won’t please everyone. Not everyone will like you. That’s fine. In fact, that’s what you want. Good, brave copy is self-weeding: so get tunnel vision on your ideal client, and those who turn away aren’t yours anyway. If you’re not up for pushy in your face sales copy, honesty is the best policy. Be brave, and remember you’re the secret ingredient your client is looking for. If you’re having trouble getting out of your own head, try using a persona. Beyonce has Sasha Fierce, Angus Young wears the schoolboy clothes, and you too can choose a persona to free yourself from the self-consciousness that’s choking your voice and/or wicked guitar riffs. The beauty of the persona is that your writing will sound more like you, instead of the self-conscious ‘nicey-nice’ version you started out with. 4. Show Them Your Face! I know. It feels super awkward choosing a nice head shot and hitting ‘publish’. Do it. We’re human animals evolved to read faces. No one trusts a person wearing a mask, so if you’re not willing to show your face in your About page, it’s going to be harder for your consumer to feel comfortable engaging with your story, and more importantly, your business. I firmly believe building relationships hinges on the sharing of stories, so share yours. You don’t need to air your dirty laundry, but be brave enough to show some of your idiosyncrasies; the things that make you a human woman. Be bold: you don’t have to be bawdy – unless you’re naturally out there – be unapologetically you. Make it funny, heartfelt, and one hundred percent you. When you share a story, you’ll be surprised how willing others are to share theirs – and that’s a good beginning to any relationship. Keep your reader moving through your story with purpose and intent. You’re not just giving the world something lovely to read. Intersperse delicious little calls to action, let your reader know how to work with you, how to contact you, and how to follow you to socials or other platforms – after you’ve led them through your website. Keep leaving them lovely morsels, and before they know it they’re enjoying themselves so much they can’t wait to get a piece of what you’re offering. When people read online content, they don’t sit back with a cuppa to relax and take it all in like we might do with a book. When we read online, we scan. Make your About page easily consumable, broken down into sweet, scannable chunks. When your reader latches onto something delicious, make sure they get the message you need them to hear. Write for the ones who read every word too, because you never know when a scanner will be intrigued enough to start reading, and you don’t want to lose them by having dry boring stuff between the tasty parts. I know. Promoting yourself feels supremely uncomfortable. Acknowledge the feeling and move on – did you get into business to stay safe and not challenge yourself? I’m not going to hire anyone I think is an ok brain surgeon – you need to show you’re the best. This is where your testimonials, awards, or any other relevant proof comes in. Telling the world how great you are is half the story: having others back that up is essential. Get your proof and use it: a happy customer’s feedback is the perfect testimonial. Search Engine Optimisation is something you can’t ignore, and why would you? All the time you invest in perfecting your copy is wasted if no one can find you on the web. There’s a lot of good, free, on-page SEO information out there you can use to get started. There’s also a load of baddies out there who want to charge you stupid amounts of money to ‘do SEO’ for you, so you’re better off investing in learning the basics yourself. 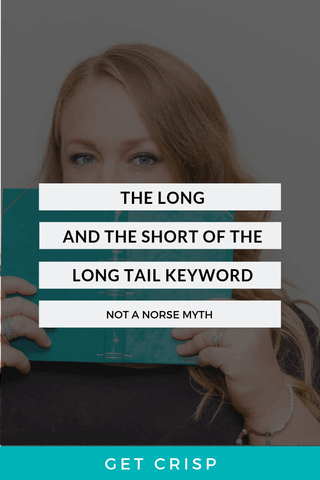 If you’re not sure which keywords to use, just use your name: Mine is 800% more frequently Googled than any other word on my website. This is the easiest part. Yet so many people don’t do it. When your customer decides they love you long time and want what you’re selling, give them the opportunity to act on that. Like now. This comes back to directing your reader; don’t just expect them to know where to go next, you need to tell them what you want from them. Throw in a Call To Action button, move them along to the Work With Me page or contact form. Do give your reader to the chance to keep saying ‘Yes, oh god yes’. Don’t make them work for your business, they won’t do it. Keep it simple, show them where to go and what to do. Avoid Paralysis by Analysis. Now you’ve read my advice, don’t think anymore. Just start. Don’t edit as you go, set a timer for 30 minutes and write the whole time. Expecting perfection gets in the way of doing, so crack on and write. Editing can come later. 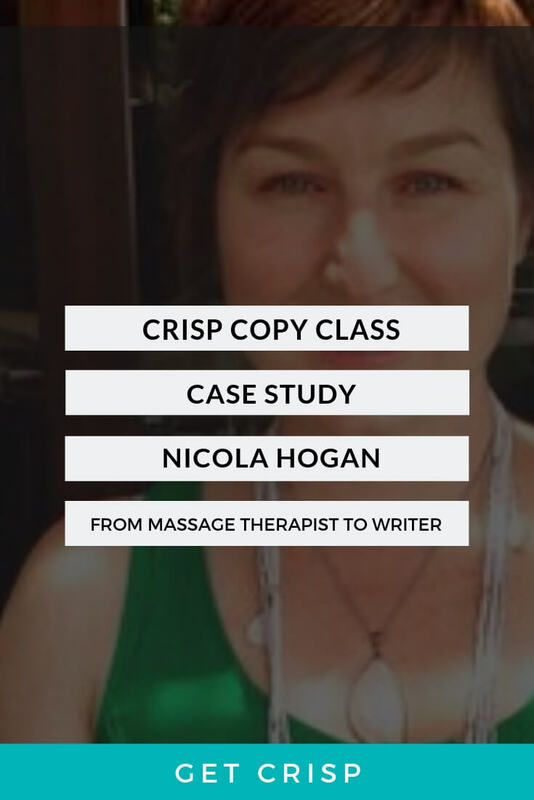 If you still feel at odds with writing your About page, you can download my free guide here, or if you need more of a structure, sign up to my All About About Copy self-paced online course here. Lastly, don’t forget; there’s no shame in outsourcing. Especially if it’s going to make you cry happy, grateful tears. About pages are my specialty and you can get yourself on my About page done-for-you copywriting list here.